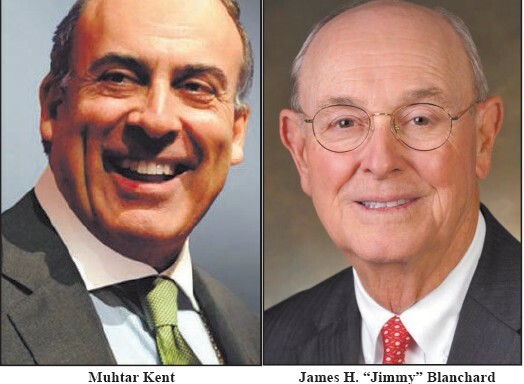 The Georgia Historical Society announced recently that Muhtar Kent, Chairman of the Board and Chief Executive Officer of The Coca-Cola Company and James H. “Jimmy” Blanchard, Retired Chairman of the Board and CEO of Synovus will be the 2016 Georgia Trustees. The announcement was made at a press conference in Savannah where the Trustees will be inducted by Governor Nathan Deal on February 13, 2016. Muhtar Kent is Chairman of the Board and Chief Executive Officer of the Coca-Cola Company, a position he has held since April 2009. Active in the global business community, Mr. Kent is the Chair of the B20 Business Advisory Council; Co-Chair of the Bipartisan Policy Center’s CEO Council on Health and Innovation, a fellow of the Foreign Policy Association and a past Chairman of the U.S. – China Business Council. Mr. Kent serves on the boards of Special Olympics International, Ronald McDonald House Charities, and Emory University. James H. ”Jimmy”” Blanchard is Chairman, Board of Advisors, Jordan-Blanchard Capital, LLC and retired Chairman of the Board and CEO of Synovus Financial Corp. In 2006, he formed the Blanchard Leadership Forum in partnership with Columbus State University’s Cunningham Center for Leadership Development to provide Columbus and the region the opportunity to interact with some of the most influential political, military, and business leaders in the world and to create a synergy that raises both the local and national standard for leadership development. Mr. Blanchard also serves on the Board of TSYS, W.C. Bradley, Co., and as Chairman of the Global Teen Challenge Advisory Board. The induction of the new Trustees will take place Saturday, February 13, 2016, at the Georgia Trustees Gala. For information on how to purchase individual seats and tables for the event, please contact the Georgia Historical Society at (912) 651-2125, ext. 114 , or www.GeorgiaHistoryFestival.org.